Are you art portrait photography enthusiasts who want to take portraits to the new level with artistic styles? Or are you a model, a designer, a stylist, a make-up artist, or just someone interested in art portraits? Then this seminar is for you. 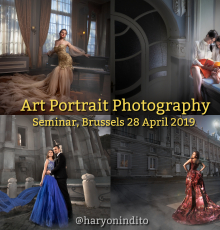 In this seminar I will explain my creative process of producing art portraits, starting from the preparation (concept/models/locations/dresses), the execution (composition, lighting, etc.) and the general principles of post-processing (Photoshop). An introduction of using off-camera flash (OCF) will be included. The seminar will be held in a strategic place 'Svenska kyrkan i Bryssel', opposite to the Cinquantenaire Park. Public transport is very easy, the venue is next to the Merode metro/train station. After the seminar, you will have new inspiration and knowledge that you can apply immediately in your next photoshoots. This seminar is essential if you want to attend my future workshops (including shooting with a model on location and editing). A testimonial from a previous participant at another venue: "Just wanted to say thanks for today! You were really great - cool, funny, informative, inspiring. I saw people quite involved and curious. You really did a very good job."